A garden with flowers is both joyful and rewarding, and has always been popular. Modern gardeners often perceive growing flowers as time consuming or difficult and opt for gardens with very few flowers in an effort to create low maintenance gardens. In actuality it is not the presence of flowers that makes a garden low or high maintenance but the choice of which flowers to grow. There are many easy care flowering plants available which allow us to have a garden which can be both low maintenance and colourful. Often we associate flowers with annual flowering plants. These do require additional care in terms of water, fertiliser and regular replacement as they are short lived. Flowers can be far more reliably grown in our gardens using perennials, shrubs and even flowering trees if your garden is large enough. There are even many low maintenance ground covers which flower spectacularly. 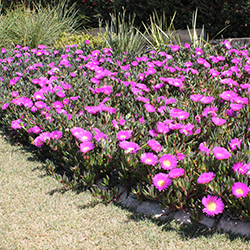 The huge hot pink flowers of the native pigface Aussie Rambler™ Carpobrotus glaucescens ‘CAR10’ PBR will add an abundance of flowers to gardens almost anywhere in Australia and will thrive with almost no care. When choosing flowering plants which will be low maintenance and easy care, old fashioned garden favourites are often popular. Petunias, geraniums and salvias are all very easy care flowering plants which can fill tough spaces with an abundance of flowers. Wherever possible look for new improved forms which offer improved flowering and most importantly will remain smaller, more compact and will require significantly less pruning to remain neat in small gardens. Gazanias are very popular ground covers which have large bold flowers throughout the warmer months. Double Gold™ Gazania hybrid ‘GT20’ PBR is the only gazania available which is completely sterile and will not spread via seed to become a bushland weed. It is also a very high performer having almost twice as many flowers as non hybrid gazanias, with exceptionally little care. Some of the other old fashioned favourites also have the potential to become bushland weeds, so low seeding varieties should be selected where possible. Agapanthus are now available in low seed varieties. 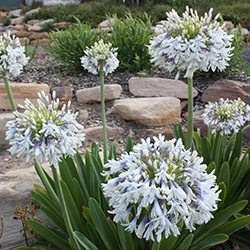 For a splash of something different in small spaces, try the mid sized Agapanthus orientalis ‘Cloudy Days’ PBR. 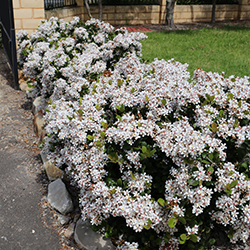 This variety also features excellent disease resistance, making it an ideal easy care flowering plant for most Australian gardens. The Queen Mum™ Agapanthus orientalis ‘PMN06’ PBR is similar but much larger. 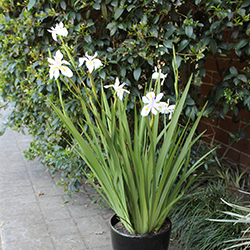 Other very popular and low care flowering strappy leafed plants are the Dietes. 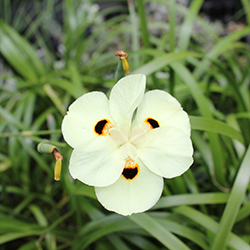 Grand Star™ Dietes grandiflora ‘Di1’ PBR offers a low seeding compact variety of the white and Fine Divine™ Dietes bicolor ‘Di2’ PBR offers a low seeding compact variety of the yellow Dietes. These plants will need less care to remain neat in a small garden than will the common varieties, and will not spread via seed to become weeds. Rhaphiolepis have long been garden favourites for their extreme hardiness and long flowering times. They have a tendency to get overly large and the seeds are spread by birds. 2 new low seeding (female infertile) varieties are now available, both of these varieties are exempt from the Rhaphiolepis ban in NSW. 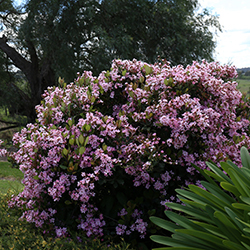 For those who would prefer a small plant needing less pruning, Cosmic Pink™ Rhaphiolepis indica ‘RAPH02’ PBR features an abundance of pink flowers on a compact plant growing to only 80cm. Cosmic White™ Rhaphiolepis indica ‘RAPH01’ PBR is bullet proof and grows just about anywhere, this is larger than the Cosmic Pink™ plant, growing to between 1.5 and 2 metres high. These easy care plants are not only long flowering and need very little pruning to maintain a neat shape, they are also hardy under even extreme weather conditions. 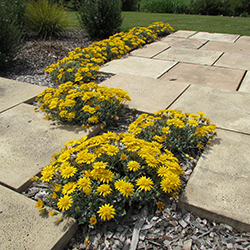 Many Australian natives are seen as low care but potentially messy and not amongst the tidiest flowering plants. Many new varieties are available which provide exactly the opposite – tough, easy care plants which are neat and compact and flower abundantly. 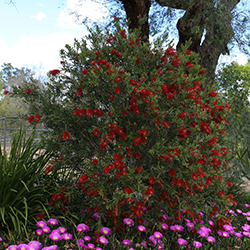 The abundant bright red bottle brush flowers of Macarthur™ Callistemon viminalis ‘LC01’ PBR make it a perfect plant for fence line planting or hedging in low maintenance gardens. Growing only to 1.8m it can offer privacy without needing constant pruning. Another compact and tidy native growing to approximately the same height is Coastal Pink™ Correa alba ‘COR10’ PBR with abundant pale pink bell shaped flowers which attract the birds. 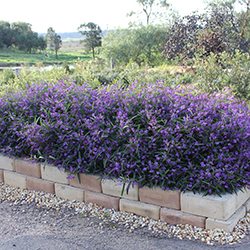 Meema™ Hardenbergia violacea ‘HB1’ PBR and Mini Meema™ Hardenbergia violacea ‘HB2’ PBR are two varieties of native ground cover which offer a denser more compact form than the common one, and dramatically improved flowers. These very easy care natives will provide masses of bright purple pea shaped flowers in later winter and early spring for a very eye catching and colourful display. Grevilleas also provide an abundance of flowers for an easy care garden. By choosing ones which grow only to the size which suits the garden, grevilleas and other natives can be very reliable and low care plants which provide an abundance of flowers for the garden and attract wildlife as well. A light annual prune after flowering will be all that these plants then need to remain compact and bushy and flower well year after year. Crimson Villea™ Grevillea rosmarinifolia ‘H16’ PBR has shown itself to be one the world’s showiest winter flowering plants. 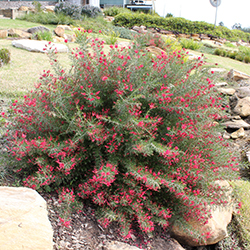 This compact grevillea grows to a neat 80 x 80cm and covers itself in masses of crimson flowers from Autumn into spring. It is very hardy, tolerating drought, frost and moderate humidity – the perfect plant for easy care flower gardens. Look for increased disease resistance when choosing low care flowering plants. While many natives can already be very disease resistant, not all are. The Velvet Range of kangaroo paws offers increased black spot resistance, making them easier to care for. Some of the old garden favourites are also prone to diseases that require extra care – care that can be eliminated by selecting varieties bred for increased disease resistance. Always choose roses which are black spot resistant. Azaleas have been highly successful in many neglected gardens, however new varieties offer not only increased flowering and increased drought tolerance but also lace bug resistance which makes them far more attractive a choice for easy care flower gardens. Autumn Royalty™ Rhododendron hybrid ‘CONLEC’ PBR and Autumn Twist™ Rhododendron hybrid ‘CONLEP’ PBR are two varieties of azalea which are both heat and cold tolerant, have increased flowering and repeat blooming throughout the year and are highly resistant to lace bug and petal blight. These are all qualities which make for very easy care flowering plants, so that even low maintenance gardens can be full of vibrant flowers.